We can tell whether two triangles are congruent without testing all the sides and all the angles of the two triangles. In this lesson, we will consider the four rules to prove triangle congruence. They are called the SSS rule, SAS rule, ASA rule and AAS rule. In another lesson, we will consider a proof used for right triangles called the Hypotenuse Leg rule. As long as one of the rules is true, it is sufficient to prove that the two triangles are congruent. 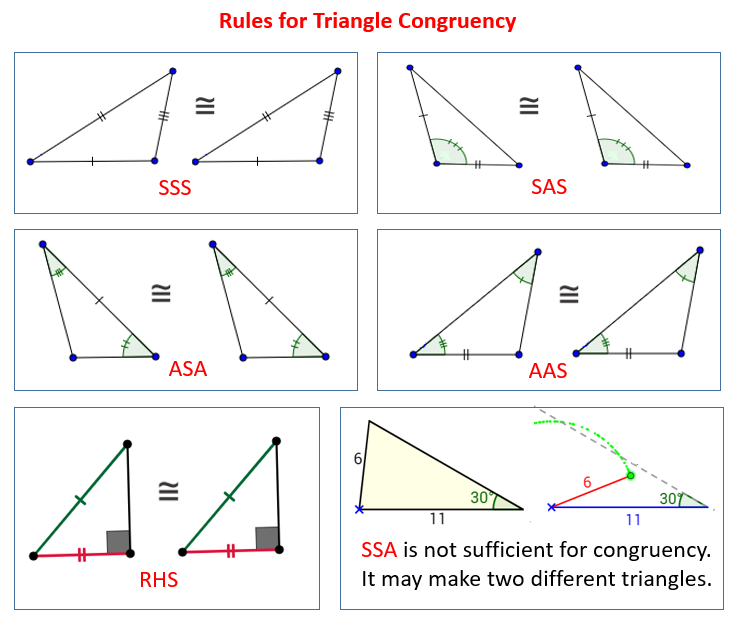 The following diagrams show the Rules for Triangle Congruency: SSS, SAS, ASA, AAS and RHS. Take note that SSA is not sufficient for Triangle Congruency. Scroll down the page for more examples, solutions, and proofs. Side-Side-Side is a rule used to prove whether a given set of triangles are congruent. In the diagrams below, if AB = RP, BC = PQ and CA = QR, then triangle ABC is congruent to triangle RPQ. Side-Angle-Side is a rule used to prove whether a given set of triangles are congruent. An included angle is an angle formed by two given sides. Angle-angle-side is a rule used to prove whether a given set of triangles are congruent. In the diagrams below, if AC = QP, angle A = angle Q, and angle B = angle R, then triangle ABC is congruent to triangle QRP. A lesson on SAS, ASA and SSS. 1. SSS Postulate: If there exists a correspondence between the vertices of two triangles such that three sides of one triangle are congruent to the corresponding sides of the other triangle, the two triangles are congruent. 2. SAS Postulate: If there exists a correspondence between the vertices of two triangles such that the two sides and the included angle of one triangle are congruent to the corresponding parts of the other triangle, the two triangles are congruent. 3. ASA Postulate: If there exits a correspondence between the vertices of two triangles such that two angles and the included side of one triangle are congruent to the corresponding parts of the other triangle, the two triangles are congruent. How to Prove Triangles Congruent using the Side Side Side Postulate? If three sides of one triangle are congruent to three sides of another triangle, then the two triangles are congruent. How to Prove Triangles Congruent using the SAS Postulate? How to Prove Triangles Congruent using the Angle Side Angle Postulate? How to Prove Triangles Congruent using the Angle Angle Side Postulate?